This may seem simple, but tourists seem to step willy-nilly out onto the road like they had a death wish. Watch for cars on both sides of the road (and hell, even the footpath) and be aggressive when crossing the road. Be aggressive! Indecisiveness will see you standing on the sidewalk for hours or getting yelled at by drivers screeching to a halt. If in doubt, cross when the locals do and try and form a group. After all, they’re probably a little more hesitant to plow down multiple people. 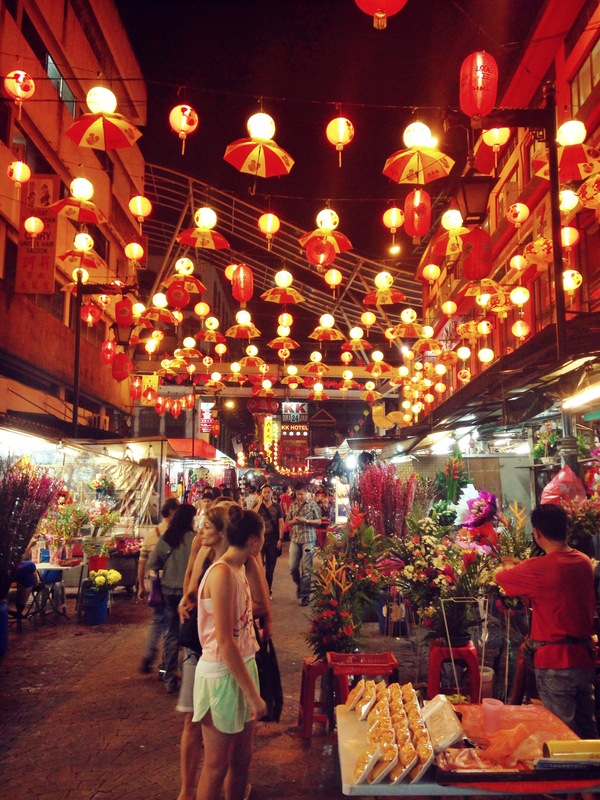 Kuala Lumpur is famous for its markets. 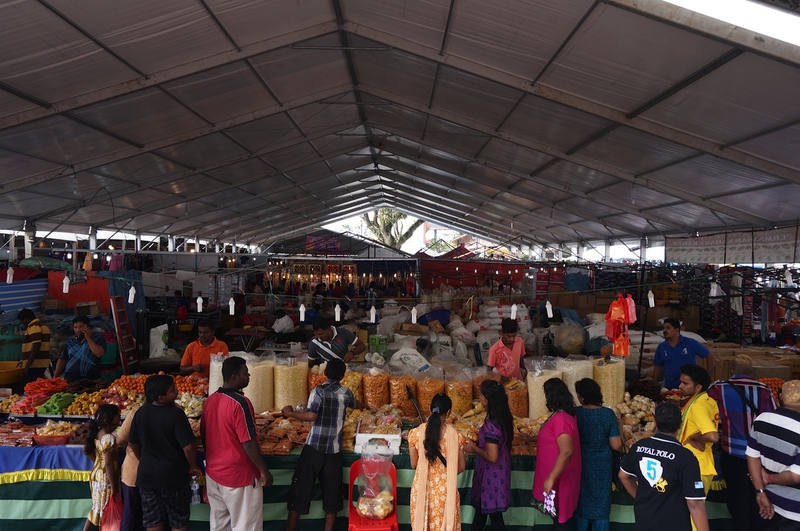 Whether you’re heading to Petaling St or the stalls at the Batu Caves, there are many bargains to be found. The shop owners will always start high, so bring down the price. A good method is offering half the price, and working up from there. If they don’t respond to your requested price, there will be plenty of other shops that are selling the exact same stock. I’ve never seen so many pairs of “Beats by Dre” (more like, Beats by China) headphones, wallets, or watches in my life. As a last resort, walking away from a shop can sometimes be the push that’s needed to get the price down. I got some harem pants down from 45 RM to 30 RM just by casually remarking that I might “have a bit of a look around.” Winner! This is what makes Kuala Lumpur a great place to start traveling. Pretty much every Malaysian we talked to spoke fantastic English. Don’t be afraid to ask the locals for help, they are happy to oblige. On more that one occasion, I had somebody come up to us and ask if we needed help. Although you can speak English with almost everyone, make sure you use simplified English and don’t talk too fast. I asked someone if there was a Fish Spa nearby and they sent me to the Aquarium in the Petronas Towers. The aquarium didn’t act too kindly when I stuck my feet into the shark tank. If you read about Kuala Lumpur you are probably going to come across a lot of blogs or articles that say you need to dress conservatively because of the varied cultural and religious backgrounds. We were surprised to find that people didn’t seem to care what we wore. A lot of the locals wear shorts and singlets. I checked with one of the hostel staff what the dress code was for the annual Thaipusam Festival. Hundreds of thousands of people travel from India, Thailand and other parts of Asia to attend and pay respect to their gods. It’s an intensely religious festival and we didn’t want to offend anyone. One thing I agreed to do on this trip is limit the amount of fast food I eat. That being said, you haven’t felt true terror until you’ve stood in line at a place you’ve never seen before, looking at food you’ve never heard of before, being talked at in a language you don’t speak, and trying to order a meal. One tactic is to point at things, to use your fingers to indicate quantities, and to nod at any questions you don’t understand. This technique has lead to eating some epically spicy, but tasty, food. A lot of people have difficulty with eating street food as it seems unsanitary to have raw meats on display outside. As a rule of thumb, try and eat at the places that are popular with the locals. They’ll know which foods will make you sick. I found a consistent theme when walking through the markets. Everyone is your friend. Just like those universally hated leaflet distributors in your city, the stall owners will hang out the front of their shops, spruiking their merchandise and trying to herd you in. Flattery is the name of the game in Kuala Lumpur markets. Everywhere Chris went, he was met with greetings like “hello handsome”, “good looking watches for a good looking man”, and “you’re tall, you play basketball, I have basketball jerseys”. That being said, it’s not smooth ego sailing all the time. After haggling at a stall, Chris was asked by the owner if I was English, to which he replied “Nah, I’m Australian,”. He said “No, you can’t be Australian. Australian’s are nice, you must be English”. His initial impulse was to immediately buy everything in his store to show him that he was nice, but as he was originally born in England, He laughed it off and walked away… While crying a little on the inside. The train system in KL is amazing. One could assume quite easily that the railways were built first, and then everything else was developed around it, such is it’s convenience. Coming from either of the airports, you will most likely arrive in Sentral, whether it be by bus or train. From Sentral, it’s only one stop to Pasar Sani, where the Petaling St and Central Markets are. 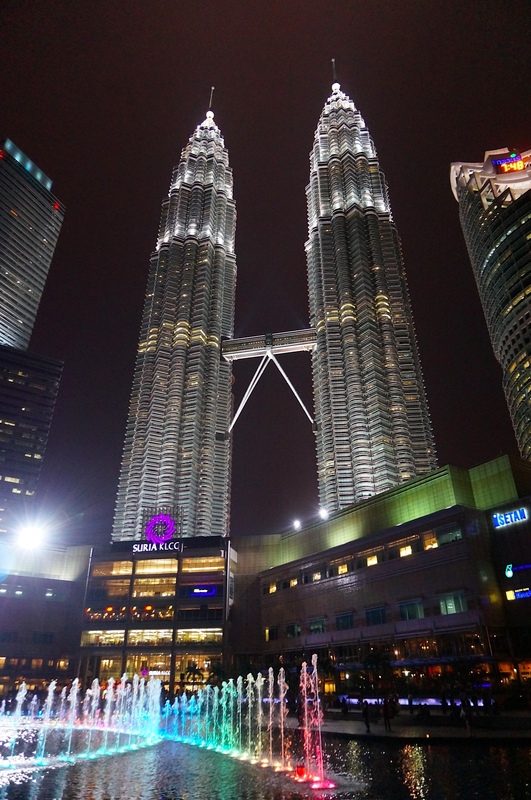 From Pasar Sani, it’s only a few stops to KLCC shopping centre and the Petronas Towers. The train literally drops you right underneath the towers. You can even catch a quick train ride to the Batu Caves, and it’s only about 500 meters from that station to the cave entrance. Trains run every few minutes and cost as little as 1 RM. Hi there, I’m a Chinese-Malaysian and I’ve just read about your experiences during your trip in Malaysia. Well, I have to say that I’m significantly proud to know that you have enjoyed very much during your holidays here. By the way, I think you are extremely brave for trying out street foods without knowing what they taste like. When I visited Bangkok a few years ago, I wouldn’t even try anything because I was afraid the taste are not of my liking and terrified that I’d get sick or something. Did you try the famous street food called ‘otak-otak’ while you were here? 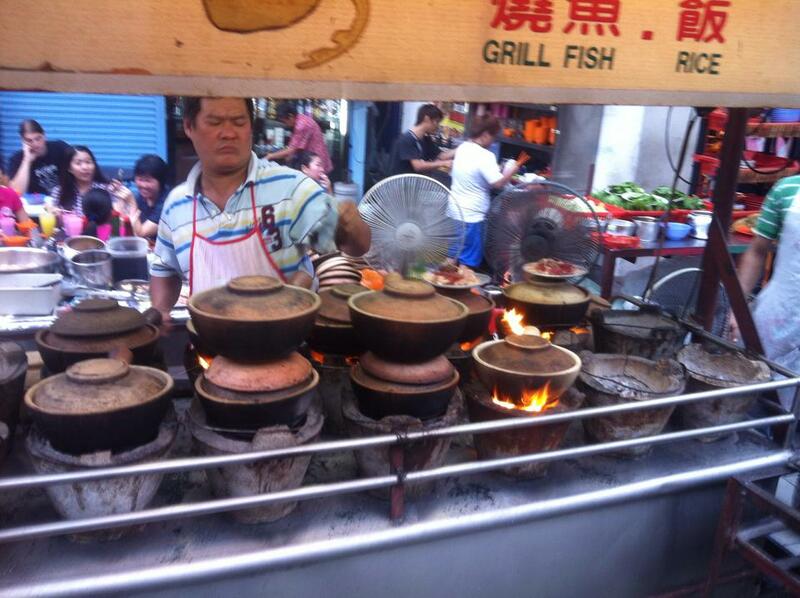 It’s a scrumptious cake made of fish meat and spices whereby hawkers would grill or steam them. You should definitely try otak-otak on your next visit if you haven’t already. Believe me, you wouldn’t regret it 🙂 Anyway, thank you for visiting Malaysia and I really hope you did have fun. Do visit again, and perhaps I can bring you around 🙂 Have a nice day. Kuala Lumpur, Malaysia can be an expensive city to visit if you’re not careful (the wares in Bukit Bintang’s malls are some of the priciest you’ll find in the region) but there’s also plenty of free stuff for travelers in the know. Hi! Just happen to pass by your blog. 🙂 My bestfriend and I will be visiting KL this September and I wonder if you can suggest what hotel should we take (like really good location-wise) considering a very tight budget? 🙂 Also, would you care to share how much should be our budget in getting around just within the city. They are a little intimidating. 🙂 Im glad you liked the post! Its very easy and there are lots of resources on the internet! Just google it and work from there. kuala lumpur is my favorite place for a holiday. I took this offer last time so I thought why not share with other people as well. Hey, I am movin from Bangkok to KL soon ! Are there many markets also with clothes ? and how bout prices? Thanks ! Great post on KL, glad you & Jo had a blast! I agree with most of what you said especially on the bargaining & the surprisingly laid back attitude towards dress. We hit Patronas during the day but recommend that future travelers go during both day & night, it’s that spectacular! My first time stopping by the blog, dig the layout, the logo, overall vibe…. keep up the great work! Thanks for stopping by and thank you for all the kind words. The petronas are spectacular aren’t they! I myself love them at night! They just go to a whole new level of awesome. Had a squiz at your blog as well. It’s great! I’m trying to study abroad in Malaysia in a few months. I’d love if I could email you and ask you some questions about your experience there. The main thing I’m worried about is safety. I am a web content developer and work as a ghost writer in many occasions. My current blog post needs to be on Kuala Lumpur which is why I stumbled across your blog while researching (never been to KL ever). I cannot comment on what you should try or what you shouldn’t, but why I am posting this comment, even when I am running out of time to finish my work, is because I simply loved your blog post. Generally I skim through a post and write one of my own (help me keep the originality and never create plagiarized content), but I simply couldn’t stop once I started reading. It was as if you took me on a virtual trip of KL. I was literally laughing when you mentioned your experience of ordering food (you are brave!!!). Kuala Lumpur is a crime infested city. just back from yesterday. I don’t think I will go there anymore. My mother’s gold chain was snatched by a motor-cyclist form the foot-path. Once again, its pathetic. Don’t go there to spoil your holiday. Great finds! I just launched my travel blog; I’ll be in KL in April and am starting to prep myself. I’m so relieved to know the train system is so great. I can’t wait to make great memories there! Nice Post, Very well done. Would love to visit Malaysia soon; I know there are lots of nice places to visit in Malaysia but this post surely give readers a heads-up.